an archive of the 2015 advertisement in TRACK magazine. FURRTREEOUS SI 102 (c. by Oak Tree Special ). Subject Stallion. SOPHASTACAT SI 97 (c. by First Down Dash ). 5 wins, 2 to 5, 2008 in QH races in Mexico and NA, $83,304 (USA), Register of Merit, Mexican Champions Clasico-G3, Kisses to Yawl H.-G3, 2nd Inaugural Classic-G3, Finalist in Heritage Place Derby-G1, Bayer Legend Texas Derby Challenge S.-G3, Bayer Legend Oklahoma Derby-G3, Dash for Cash Juvenile Invitational [R]-G3. Last raced in 2008. Cat Scratch Fefurr SI 102 (f. by Apollo-TB). 3 wins at 2 and 3, 2010 in QH races, $47,221, Register of Merit. Last raced in 2010. Lion Drive SI 87 (c. by Special Effort ). Winner at 3, placed at 6, 2008 in QH races, $$17,732, Register of Merit. Last raced in 2009. Finn Furr SI 94 (f. by Fishers Dash ). 2 wins at 2 in QH races, $15,956, Register of Merit. Last raced in 2007. Gridiron SI 86 (c. by First Down Dash ). Winner at 3, 2008 in QH races, $13,616, Register of Merit. Last raced in 2008. Furr Flyin SI 89 (f. by Takin On the Cash). Winner at 2 in QH races, $11,162, Register of Merit. Last raced in 2010. Feline Frisky SI 83 (g. by Pure D Dash ). Winner at 3 and 4 in QH races, $6,743, Register of Merit. Last raced in 2004. BEELINE FELINE SI 100 (f. by Rare Form ). Stakes winner, see above. The Hallelujah Cat SI 105 (g. by Special Leader ). 5 wins at 3 and 5 in QH races, $52,803, Register of Merit, 3rd Trinity Meadows Yearling Sale Futurity [R]-G2, Fair Meadows Juvenile. Last raced in 1999. - Kitty Kat Dash SI 95 (f. by Dash Ta Fame ). 3 wins at 2 and 3 in QH races, $6,778, Register of Merit, Finalist in Speedhorse Gold & Silver Cup Dby [R]-G3. Last raced in 1997. 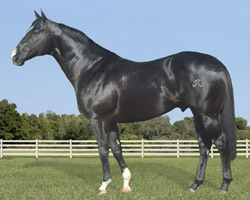 Dam of 8 QH foals, 7 to race, 6 winners, 6 ROM--Dam of PRRR D TERRIFIC SI 91 (g. by Pure D Dash ). 5 wins, 2 to 5 in QH races, $50,573, Register of Merit, Fair Meadows Juvenile S., 3rd Bob Moore Memorial S. Last raced in 2006. - Purr D Cat SI 85 (f. by Pure D Dash ). Winner at 2 in QH races, $4,852, Register of Merit. Last raced in 2000. 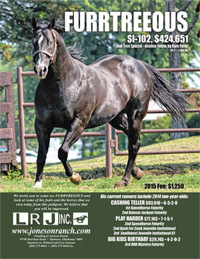 Dam dam of 5 QH foals, 3 to race, 1 winner, 1 ROM-- Dam of THIS CAT PURRS SI 106 (f. by First Wrangler ). 7 wins, 2 to 5, 2008 in QH races, $39,923, Superior Race Horse, Register of Merit, Great Lakes Earl Clark Memorial Futurity, Mothers Day Silver Cup S., 2nd Fathers Day Gold Cup. Last raced in 2008. - Pistol Packin Cat SI 96 (g. by First Weapon ). Winner at 3 and 8 in QH races, $13,949, Register of Merit. Last raced in 2005. - THE CHEETAH SI 99 (f. by Pure D Dash ). 12 wins, 2 to 5 in QH races, $211,088, Superior Race Horse, Register of Merit, Khey/Y96 H.-G3, Midwest City S.-G3, Casino Cash Derby, AQHA All-Star Jockey Challenge Sun Bowl S., Miss Betty S., etc. Last raced in 2003. - Kitty D Ville SI 105 (f. by Takin On the Cash). 3 wins at 2, placed at 5, 2010 in QH races, $108,456, Superior Race Horse, Oklahoma Hi-Point Aged Mare, Register of Merit, 2nd Manuel Lujan H. [R]-G3, Sawgrass S., Charlie Claborn Memorial S., Belles S., Fair Meadows Maturity, etc. Last raced in 2010. - Furrtastic SI 95 (c. by Takin On the Cash). Winner at 2 and 3 in QH races, $23,075, Register of Merit. Last raced in 2010. - Xtr Fast Cat SI 89 (g. by Pure D Dash ). Winner at 3 and 4, 2008 in QH races, $19,108, Register of Merit. Last raced in 2008. - Dash Furr Cash SI 90 (c. by First Down Dash). Winner at 3 in QH races, $14,856, Register of Merit. Last raced in 2009. - Wham Bam Cat-QH SI 93 (g. by Pure D Dash-QH). 2 wins at 3 in QH races, $21,207, Register of Merit. Last raced in 2009..
- Sixy Sambasa SI 89 (f. by Sambaso Dancer ). Winner at 3 in QH races, $10,094, Register of Merit. Last raced in 2007. - Makin a Beeline SI 91 (g. by Rare Form ). Winner at 4 in QH races, $8,834, Register of Merit. Last raced in 2004. - Purr D Kitty SI 86 (f. by Pure D Dash ). Winner at 2 in QH races, $3,300, Register of Merit. Producer. Last raced in 2002. Par D Cat Dash SI 101 (g. by Pure D Dash ). 3 wins, 2 to 4 in QH races, $32,256, Register of Merit. Last raced in 2002. Catalyzed SI 91 (g. by Pure D Dash ). 3 wins at 3 and 4 in QH races, $14,993, Register of Merit. Last raced in 2004. Felinity SI 94 (f. by Rare Form ). 2 wins at 3 in QH races, $14,770, Register of Merit. Last raced in 2004. Producer. - DOS GATOS - APHA SI106(colt by Dos Poruno). $36,003 in Paint races. Green Country Handicap, 2nd SpeedHorse Derby [R]-G1. Long Gone Cat SI 95 (g. by Easily Smashed ). 5 wins, 2 to 4 in QH races, $10,330, Register of Merit, Finalist in Vespero Express S.-G3. Last raced in 1993. Ojo de Gato SI 96 (c. by Mr Eye Opener ). Winner at 2 in QH races in NA, placed at 5 in QH races in Mexico, $5,031 (USA), Register of Merit. Last raced in 2007. Jag Wired SI 81 (g. by First Weapon ). Placed at 2 in QH races, $4,573, Register of Merit. Last raced in 1998. - Rarin to Rumble SI 92 (g. by Rare Bar ). 7 wins, 2 to 5 in QH races in Mexico and NA, $17,733 (USA), Register of Merit. Last raced in 2002. 2nd IDAHO CUP DERBY [R], 3rd KIP DIDERICKSEN H.
1st & 2nd in first 4 starts; 2nd MISS ELLEN S.